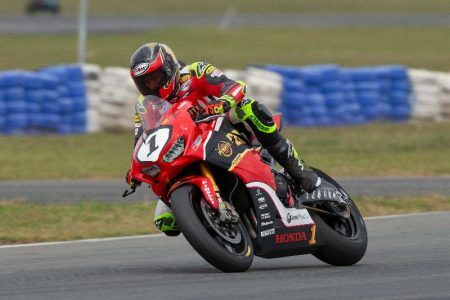 Troy Herfoss has led home Cru Halliday in each of the two races in Round 2 of the Australian Superbike Championship at Wakefield Park. Halliday qualified on pole but it was Wayne Maxwell (Suzuki) who would take an early lead in Race 1. Herfoss (Honda) overtook Halliday on Lap 7 and then got by Maxwell at his second attempt, on Lap 13. Along the way, he broke the lap record with a 57.525s on Lap 8 and won by 1.189s. Halliday dropped as low as fourth after an error on Lap 11 at Turn 4 but ultimately snatched second from Maxwell when he sent his Yamaha down the inside at the final corner of the race. In Race 2, Herfoss jumped into first position immediately and while Halliday tailed him all the way, there would be no change to the order at the front with 0.367s between them at the chequered flag. Mike Jones (Ducati), riding in place of Troy Bayliss as the three-time Superbike World Champion sat out the round due to recent finger surgery, finished the race in third after passing Maxwell at Turn 11 on what would be the penultimate lap. The race was cut short due to a crash for Lachlan Epis (Kawasaki), but full points were awarded for the 13 laps completed. Halliday leads the championship, by five points back to Herfoss, ahead of Round 3 at The Bend on April 26-28.